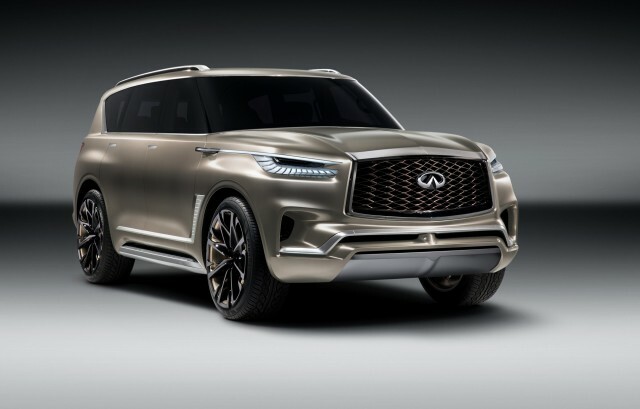 Infiniti gave us a preview of its redesigned QX80 during last month’s 2017 New York auto show in the form of the QX80 Monograph concept. At the time, Infiniti was short on info but Motor Trend has managed to learn a few details after speaking with Roland Krueger, CEO of the brand. The former BMW exec confirmed that the redesigned QX80 will enter production at the end of the year, suggesting we’ll see it in showrooms as a 2018 model. A debut at November’s 2017 Los Angeles auto show is a strong possibility. The exterior will be very close to what you see on the QX80 Monograph concept and we’re told the interior will get a revamp too. What won’t be new are the mechanicals. The redesigned QX80 will keep the platform and V-8 engine of the current QX80 which in fact dates back to the 2011 QX56. This means body-on-frame construction, four-wheel drive, 8,500-pound towing capacity, and a 5.6-liter V-8 good for 400 horsepower and 413 pound-feet of torque. The mechanicals are shared with the latest Nissan Armada which is actually a rebadged version of the Patrol sold overseas. We’ve also heard that Mitsubishi might use the mechanicals for a redesigned Montero, now that the fellow Japanese brand is an alliance partner of Renault and Nissan. In his interview with Motor Trend, Krueger hinted at the possibility of a smaller engine for the redesigned QX80 so we might eventually see the brand’s 3.0-liter twin-turbocharged V-6 which delivers 400 hp in its current most potent setting. Infiniti is also known to be developing a hybrid powertrain using this engine. Previewed in the Q60 Project Black S concept from the 2017 Geneva auto show, the hybrid powertrain is said to be delivering close to 500 hp. Note, the redesigned QX80 isn’t the only new Infiniti SUV on the way. A redesigned QX50 is also just around the corner. Google Rolls Out Panic Detection Mode In Android 7.1 Nougat To Protect Users From Malware: How Does It Work?